Al Jewer and Andy Mitran are a supremely talented multi-instrumental duo who’ve released a handful albums over the past several years. Having first heard their incredible music via their 2011 landmark album Music of the Earth, I’ve not only followed their work ever since, but have enjoyed witnessing both the musical evolution and stylistic progression over the course of their artistic careers. Likewise, I recently had the pleasure of interviewing Jewer and Mitran, as they shared deeper insight into their work and specifically their latest album entitled Perihelion, which is named after an astronomical point when our earth is closest to the sun during its yearly orbit. For the duo, perihelion also signifies the “burning off of artifice and unconsciousness”, noting its metaphorical parallel to a process of enlightenment. Blending ambient-world and contemporary instrumental motifs, the duo variably showcase numerous instruments throughout, with Jewer performing on several woodwind and brass instruments while Mitran plays an array of keyboards and global percussion. Guest musicians include Miriam Stockley (vocals), Erik Scott (bass), Michelle Qureshi (acoustic, electric and slide guitar), Sherry Finzer (alto and bass flute), Peter Phippen (shakuhachi), Bob Lizik (bass), Richard Gannaway (bouzouki), Biff Blumfumgagnge (violin), Lisa Downing (piano) and Ian Maksin (cello). Resulting in a congruous melding of the traditional and old-world with the contemporary and technological, the overall sound feels both earthy and grounded yet dreamlike and transcendental. Listeners familiar with Erik Scott’s work will immediately recognize his signature bass licks on the opening “Gathering Heart”, a rhythmic and lively piece which effectively signals the starting point of an exciting journey ahead. Of notable highlight is “Eternal”, which showcases the unmistakable vocals of South African singer Miriam Stockley (of Adiemus and AO Music fame). Miriam also sang on the opening track to Jewer and Mitran’s previous album, Transmigration, and she once again shines brilliantly here with her layered tribal-esque vocals, which are accompanied by other harmoniously blended voices woven into the composition's exhilarating arrangement. My absolute favorite piece herein is the more ethno-ambient styled “Awakening”, which employs beautifully hypnotic poly-rhythms consisting of bells, hang, djembes and talking drum. Further topping it off is Peter Phippen on Shakuhachi, a Japanese flute accompanied here by other woodwind instruments. A warmly shimmering piece that I simply never tire of, this one always makes me think of being on an exotic safari and watching the sun set through the trees. The aptly-named “Full Circle” serves as a mesmerizing closure to the album, and also symbolically marks the earth’s completion of its journey around the sun. Intentionally meditative, both Native-style and silver flutes gently lead the piece in tandem with soothing violin amid beautiful bell-tones and electro-atmospherics of which seemingly convey misty twilight imagery. Notably echoing aspects of the duo’s previous Transmigration and Two Trees albums, their lush soundscapes often paint mental images of either Southwest American deserts or African jungles and wildlife, depending on the piece. Likewise accompanied by stunning cover and inlay artwork depicting earth-space photographs, the album’s images further help to convey an appreciation of nature, culture and human potential that’s seemingly reflected in these pristine musical environments. 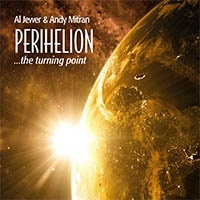 Another outstanding effort from Al Jewer and Andy Mitran, Perihelion is guaranteed to find much appeal, especially, among many fans of both ambient and world music!